Save the date for the 2015 NAFSA Region XII Conference in Honolulu, to be held at Hilton Hawaiian Village Hotel and Resort in Waikiki. Hotel registration is now open. Conference registration will open on August 1, 2015. It is recommend that you book your hotel early to take advantage of the discounted rate. These rates will be in effect for NAFSA Region XII conference participants five days before the conference and five days after the conference, and there are a limited number available for these rates so book your rooms. Please go to https://resweb.passkey.com/go/1024NAFSA2015 to book your rooms. PLEASE BE SURE TO MENTION THE GROUP CODE WHEN CALLING IN TO MAKE A RESERVATION. Are you looking for a roommate for the upcoming 2015 NAFSA Region XII Conference? 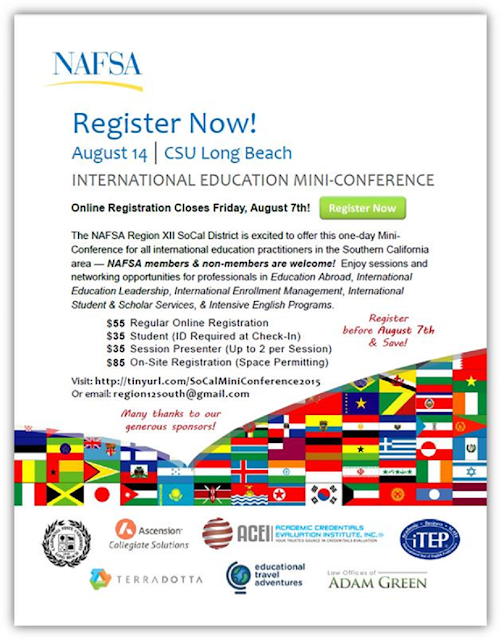 Susan Sermeno, International Student Advisor at JFK University and 17 year member of the Bay Area PIER group is looking for a roommate for the NAFSA Region XII Regional Conference in Hawaii. She has a room booked at the Hilton Hawaiian Village Hotel and Resort in Waikiki for Tuesday, Wednesday and Thursday night of the conference at $215/night with two double beds and is interested in finding a female roommate to share the room costs. If you may be interested, please contact Susan Sermeno at: ssermeno@jfku.edu. There will be a Southern California District one-day mini conference on Friday, August 14th, 2015 from 8:00 A.M. – 3:00 P.M. at California State University, Long Beach. Please see the flyer. Visit the Conference Website for on-going updates & program details. Register for the Conference online, & send any questions to region12south@gmail.com. Will provide high level advice and counsel to more than 6,000 international undergraduate, graduate, and non-degree students and their dependents on a broad spectrum of complex and sensitive immigration, visa, employment, academic, enrollment, financial, emergency/crisis intervention, health, and adjustment issues. Other responsibilities include analyzing, interpreting, and explaining complex US federal immigration, labor regulations, and campus policies to UC San Diego international students, academic departments, and campus units. The Advisor will direct students and their dependents in the preparation of successful visa applications, employment authorization, travel and reentry into the USA, Social Security numbers, driver licenses, and any other requirements from the beginning of an academic program to 1-3 years after graduation. In addition, the Advisor serves as Designated School Official (DSO) and Alternate Responsible Officer (ARO) for all University F-1 and J-1 student documents; prepares immigration documents required for F-1 and J-1 visa status; serves as a liaison with various US government agencies; and ensures compliance with all federally mandated reporting requirements. Director, American Language and Culture Institute, Cal State San Marcos San Marcos Campus (North County San Diego) We are looking for an innovative/dynamic leader to grow our English language program offerings and to share their experience with a dynamic team of faculty and staff. Salary range is $75,000 to $85,000 per year based on prior work experience. Prior ESL teaching and management experience referred. CSUSM is dedicated to a "working environment that connects priorities, plans, budgets and rewards", that embraces diversity and commitment. We are a growing and maturing campus and we are committed to making your involvement with CSUSM fulfilling. Details of the position can be found at http://www.csusm.edu/jobs.htm Position Number 1985. We hope you will take this opportunity to view this position on our website and apply for this position to meet your career goals and aspirations.